The Lao PDR is blessed with abundant land resources and high agricultural potential. Thus, the Lao PDR is steadily increasing its exposure to international markets and commercial opportunities with an aim of playing a role of supplier of agricultural products to the neighboring countries. To attain this aim, the Lao PDR is reducing its dependence on traditional agriculture, and has developed the significant transport network including higher-capacity transport corridors connecting with the People of Republic of China and Thailand as well as the smaller transport routes east to Viet Nam so far. However, the coverage of rural access roads connecting with these routes/corridors is still limited and their quality is generally poor. The limited and unreliable transport network and constant risk of landslides constrain market access and limit production options to nonperishable goods. These underdeveloped rural access roads hamper the commercialization of agriculture. The Project Area covering 4 provinces of Bokeo, Luang Namtha, Oudomxay and Phongsaly in the northern region of the Lao PDR is envisaged with the similar road network condition. As for agriculture condition in the Project Area, the sifting cultivation is prevailing. The irrigated area is only 3% of 45,000 ha rice area in 2007, which results in unstable and low production of rice. In addition, the limited access to higher-yielding varieties and production inputs gets spurs to such poor production in agriculture. These lead to the high poverty rate of 37% in the Project Area. The analysis on the high poverty rate showed that poverty would be caused by lack of links to markets and infrastructures. 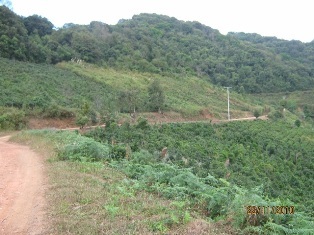 In order to improve the current poor situations in the Project Area, it is required to remove 2 fundamental constraints of low agricultural productivity and limited market access through investments in i) rural infrastructure for irrigation and rural access roads and ii) initiatives to achieve greater commercialization in agriculture by exploiting opportunities in the Lao PDR and neighboring countries. The impact will be improved rural household incomes in the Project Area. The outcome will be increased agricultural productivity in the Project Area.